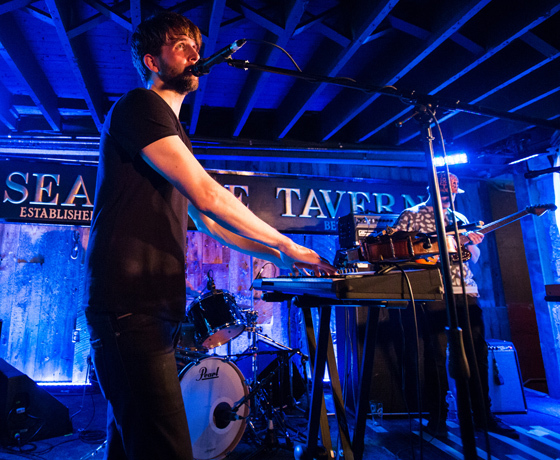 Prior to Owen Pallett's mesmerizing In the Dead of Winter set, Tara Thorne of opening act Dance Movie relayed a relic from their shared past: her ticket stub from Pallett's show at Halifax's St. Matthew's Church nearly ten years ago. That was back when Pallett was still known as Final Fantasy, and when, despite his affiliation with Arcade Fire, he was still under-the-radar enough to be the sort of performer who wowed both with his immense talent and the element of surprise. Three albums later, with dozens of high-profile collaborations and an Oscar nomination to his name, you'd think Pallett would be done with surprises. Not that last year's impressive In Conflict didn't take his songwriting in some welcome new directions, mind you: it's more that as an artist's modes and mantras become more and more familiar, the gap between your expectations and the experience they deliver inevitably folds in on itself. And yet Pallett's show last night had me reeling with unexpected delight time and time again. Maybe it was discovering that some of my favourite, most dizzying loops from In Conflict were being constructed not by keyboard, but with Pallett's violin; more than ten years into this project and it's like he hasn't come close to maxing out what he can do with the instrument. Or maybe it was the furious rock energy that he brought to "The Riverbed," a mode I'm not sure I've ever seen him turn to in performance to quite the same level. And even with the welcome addition of supplemental players for most of the set — Matt Smith and Robbie Gordon, adding heft and depth to the material — Pallett's four solo songs were every bit as compelling. "Song for Five & Six," in particular, demonstrated just how far he's able to stretch his one-man orchestra without losing the scope and scale a song like that deserves. The set closed with a couple of classics — "The Great Elsewhere" and, as the encore, "This is the Dream of Win & Regine" — that served almost as signposts, reminders of key moments on Pallett's journey from the early days as Final Fantasy to the present. But even then, my first thought on my walk to the evening's next performance was that, for all his deserved acclaim and accomplishments so far, Pallett's best might still be yet to come.